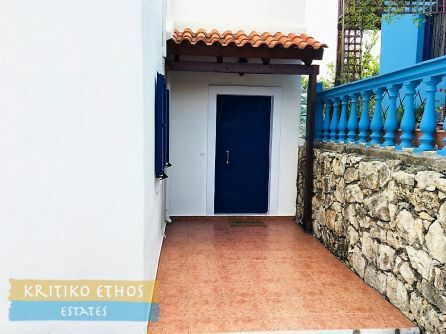 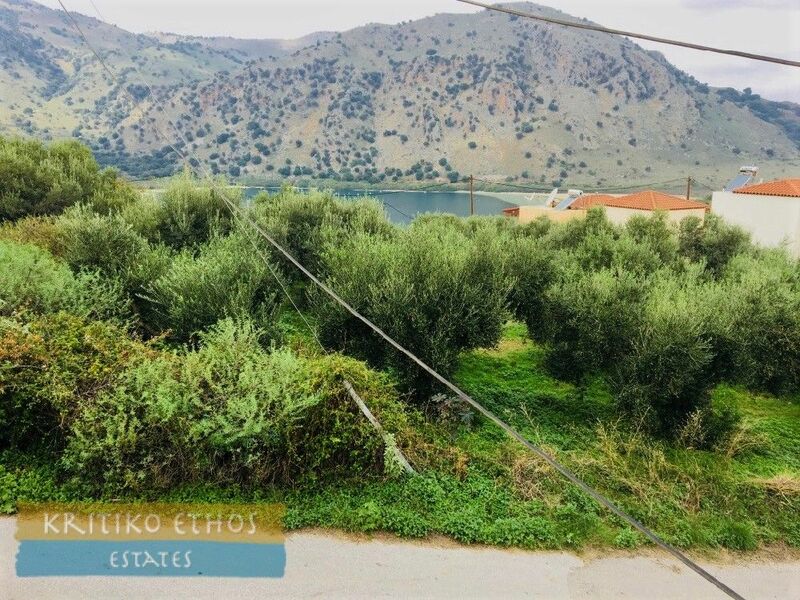 For sale near Kournas Lake: Excellent detached and fully furnished two bedroom home, perfect for a holiday home or permanent residence! 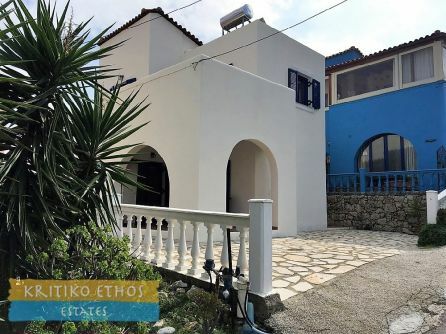 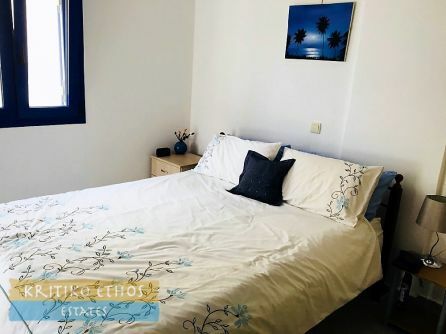 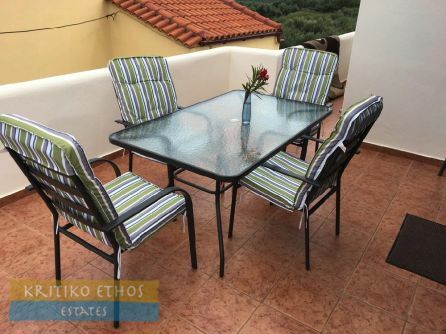 Home > Homes And Villas > For sale near Kournas Lake: Excellent detached and fully furnished two bedroom home, perfect for a holiday home or permanent residence! 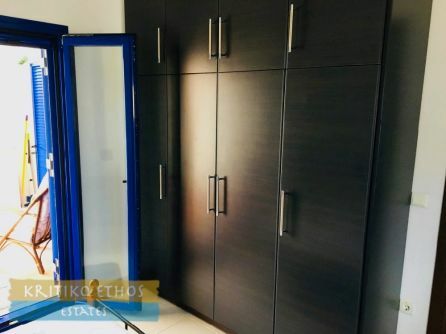 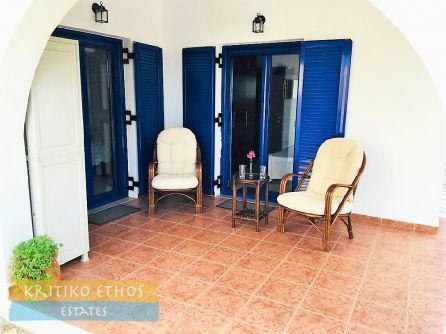 Very comfortable fully furnished and well maintained 80 sqm two bedroom home near Lake Kournas! 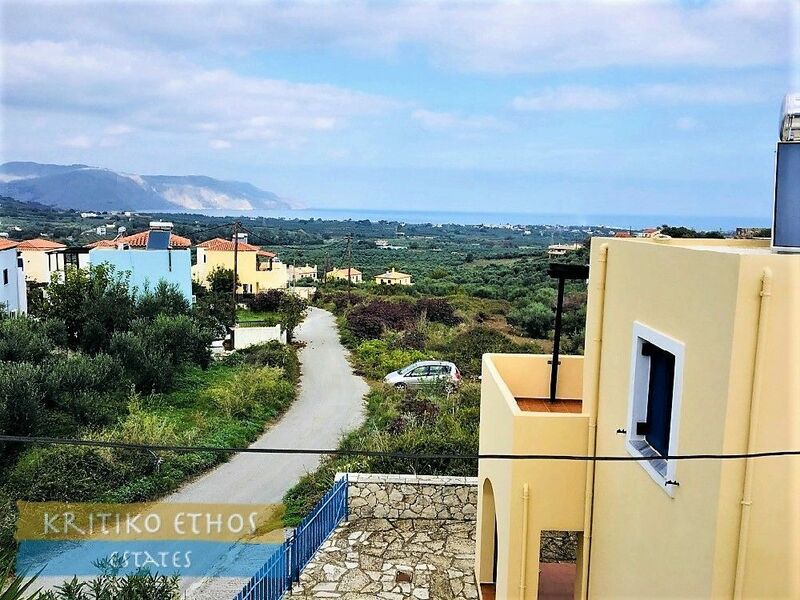 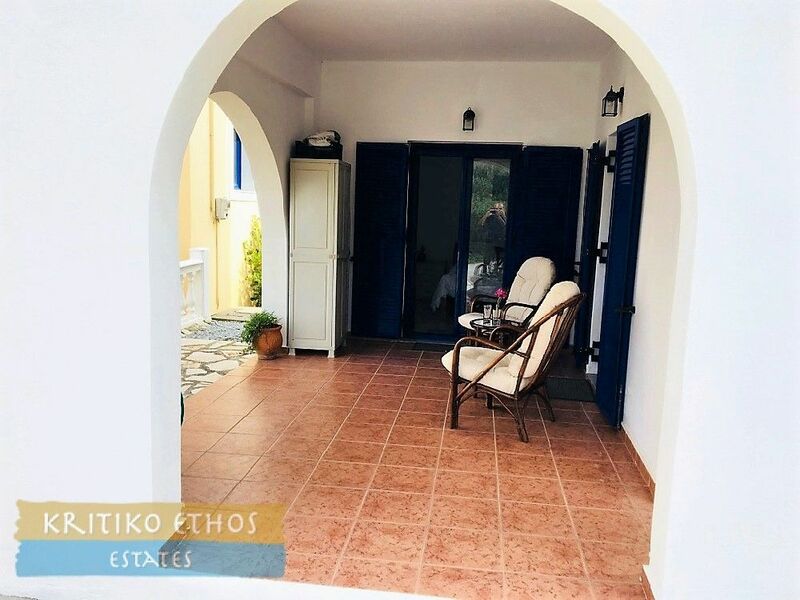 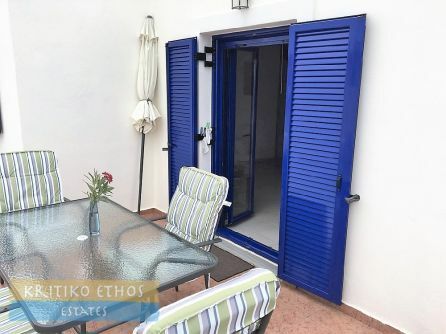 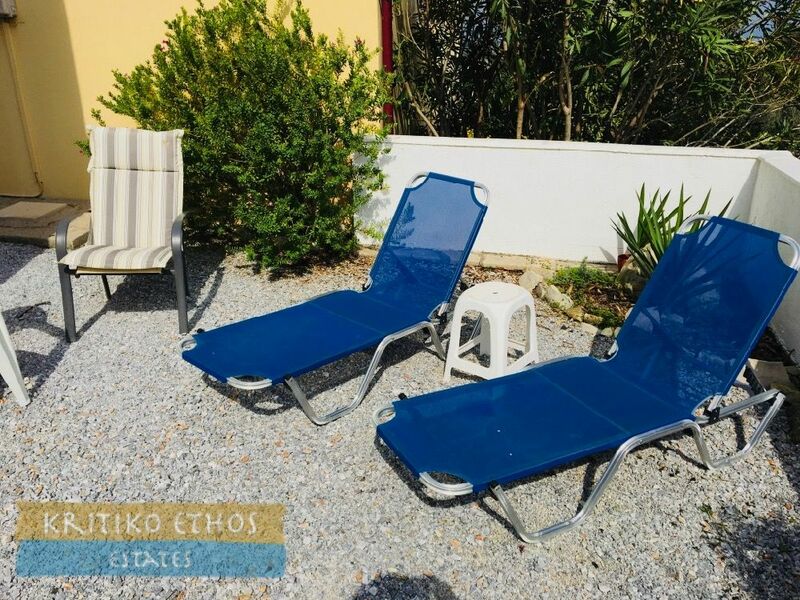 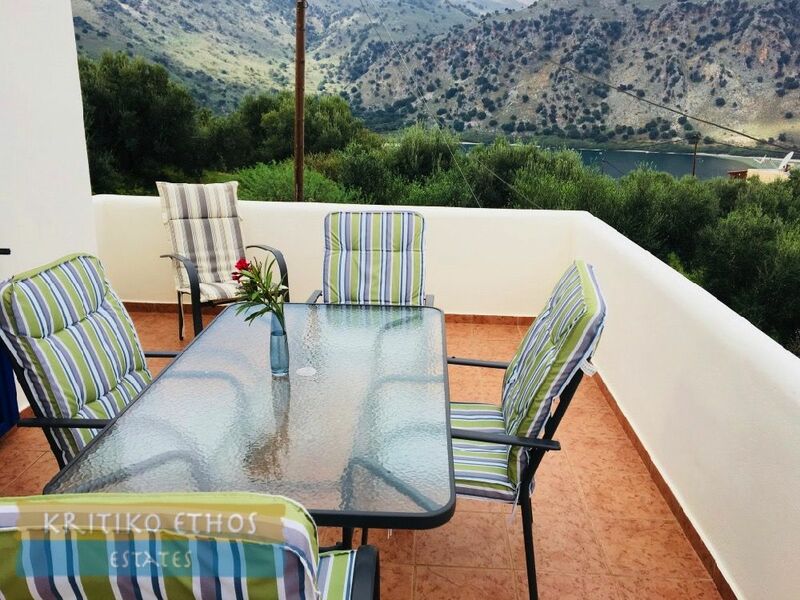 The home is a perfect holiday retreat or a great permanent residence on Crete offering very pleasant outdoor spaces, beautiful views, and an excellent location just a few minutes walk to tavernas, kafenions, and the lake. Very easy access to Georgioupolis plus the National Road leading to Chania and Rethymnon. Situated on a quiet tarmac lane, entry to the home is via a stone-paved private driveway. 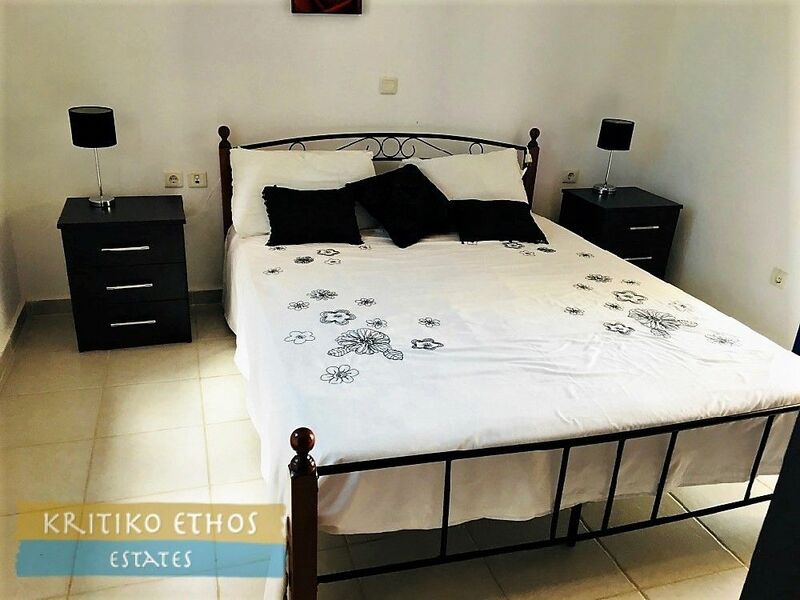 The ground floor comprises two double bedrooms, each with plenty of wardrobe space. 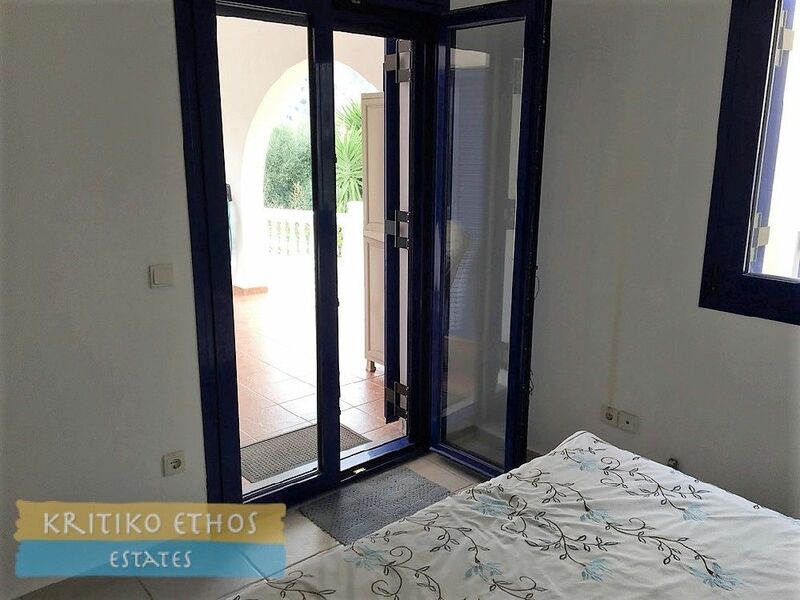 Both bedrooms have French doors opening out to the spacious covered front veranda. 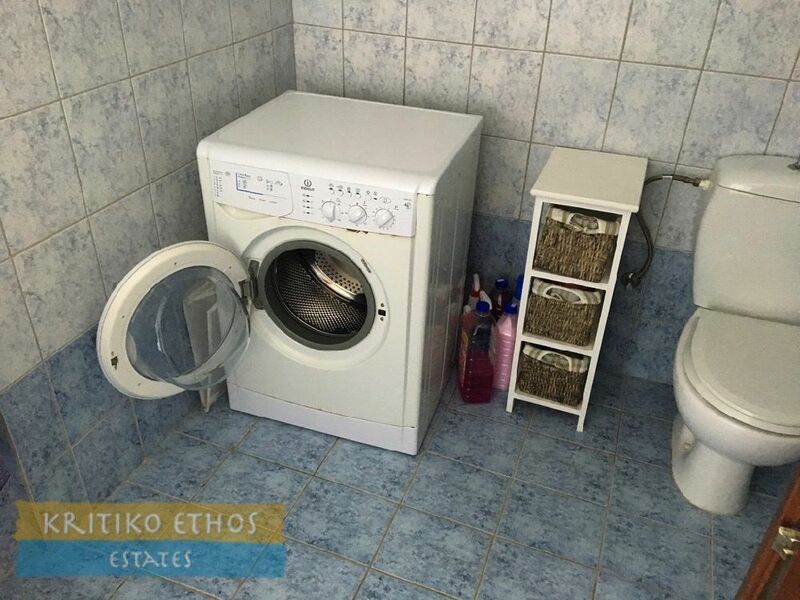 A large family bathroom is also located on the ground floor and the clothes washer has been conveniently located here. 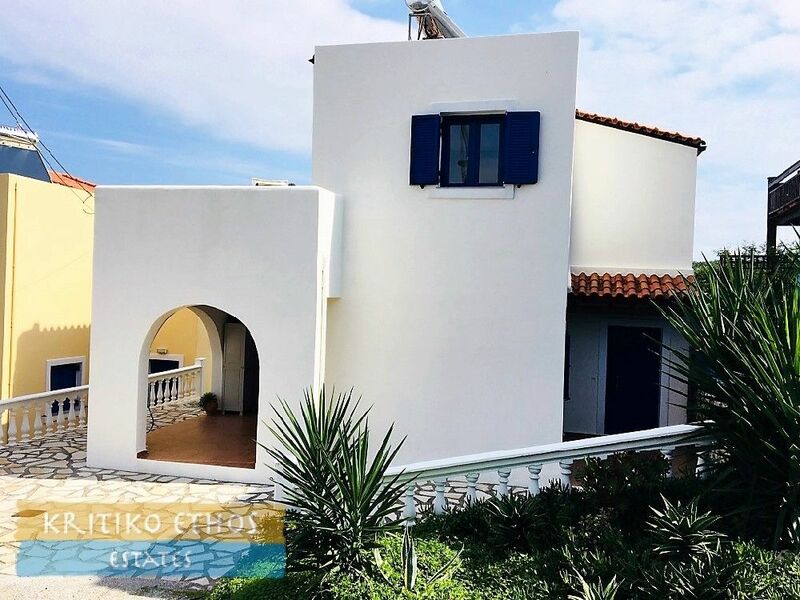 A tiled staircase leads directly from the main entry door up to the first floor with a spacious open-plan kitchen, dining area, and lounge. 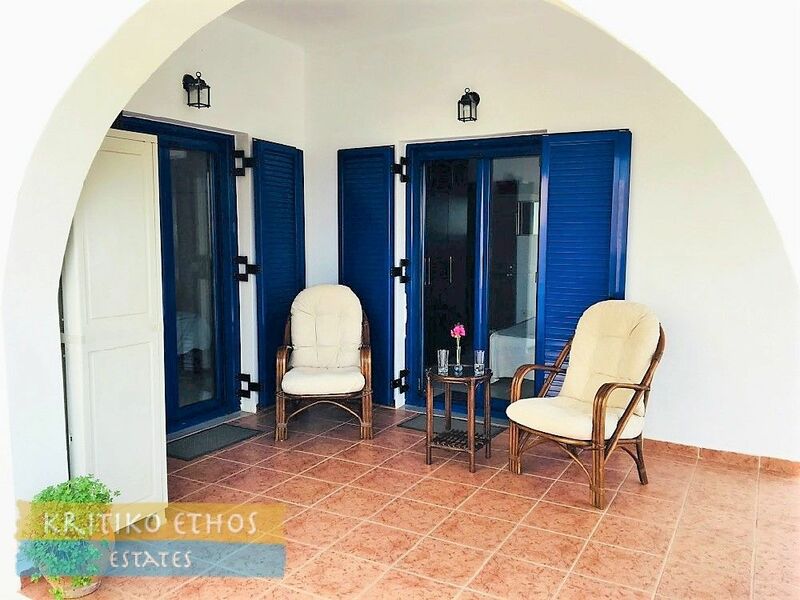 French doors open from the lounge to the broad front veranda … the prefect place to dine or relax with excellent views to the lake, the mountains and the surrounding countryside. 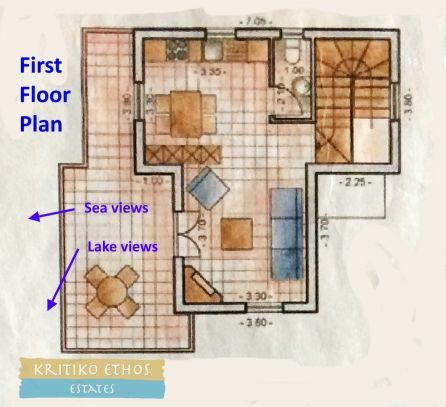 The first floor has a warm and pleasant vaulted wood ceiling. 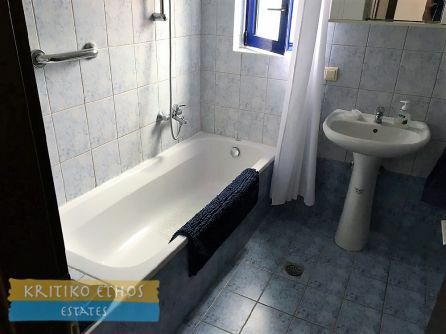 Also on this level is a fully-tiled WC. Everything is included in the selling price … all white goods, furniture, fixtures and fittings. The home is ready to live in and enjoy immediately! 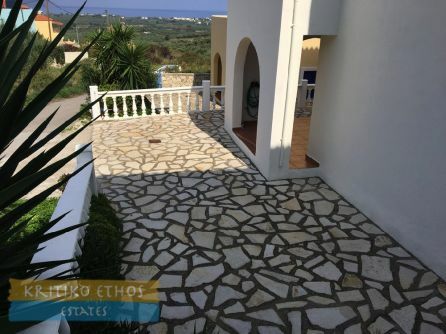 The home is situated on a 224 sqm plot with adequate space in the rear garden for a spa or Jacuzzi should the new owner desire. The pleasant gardens at the front and rear of the home have been kept as a low-maintenance area with stone paving and gravelled areas and several colourful plants and shrubs. The home has air conditioning in the master bedroom, solar panel, blue aluminum doors and double glazed windows. 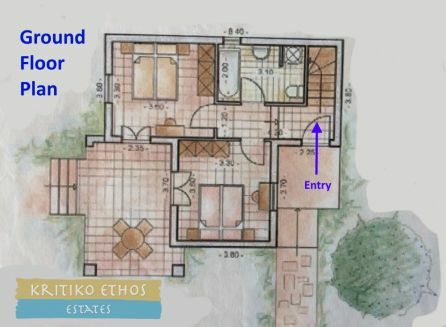 Pipes have been installed for central heating if required although a wood-burner or pellet burner would be a more cost-efficient option for winter heating.